Verbena Bonariensis is a perennial plant that flowers in late summer to mid-autumn. It has tall, architectural stems with sparse leaves, crowned by flattish heads of lavender-purple flowers. This is a wonderful plant for bringing height to the border and its airy structure allows you to see through to the plants behind. It also works well in prairie style planting surrounded by ornamental grasses. The seed heads are attractive and add autumn and winter interest to the garden. This plant is also very attractive to bees and butterflies making it perfect for a wildlife garden. It often self-seeds producing lots of new plants each year and the cut flowers make a long lasting pretty addition to an arrangement. This guide will explain how to grow and care for your Verbena Bonariensis as well as how to deal with any problems you may encounter. Verbena Bonariensis is an easy to grow, versatile plant that can add height, colour and interest to the garden. It is easy to grow from seed, making it an inexpensive way to add colour and variety to any planting scheme. This plant is a perennial, meaning it comes back year after year. However, as it is not full hardy it is sometimes grown as an annual in colder areas of the country. The plant will self-seed, so, once you have sown this plant you are pretty much guaranteed to have them growing in your garden thereafter. These perennial plants will resume growing in spring and begin flowering a few weeks later. Verbena Bonariensis enjoys full sun and will flower best in this position, however, it can tolerate partial shade. These plants are pretty drought resistant. However, a thorough soaking them once a week will help the flowers to last longer. Do not let them sit in boggy soil though, as this could cause the roots to rot. Water at the base of the plant rather than the leaves to reduce the humidity. Watering early in the day will also allow moisture on the foliage to dry out in the sun reducing the likelihood of a fungus attack. Verbena Bonariensis enjoys moist, well-drained soil to which organic matter has been added. It will happily grow in chalky, clay or sandy soil. This plant enjoys an annual mulch of well-rotted manure or compost. A layer of straw or leaf mould can also be used as a protection from winter frosts. Bought plants should be planted as soon as possible after purchase. You should prepare the soil with some well-rotted manure or soil improver. Remember that this plant grows quite tall so choose an appropriate location such as towards the middle or back of a border. Dig a hole twice the size of the rootball and put the plant in so that its base is level with the surrounding soil. Backfill and firm in the plant to ensure there are no air pockets around the roots. Water well to settle the soil. If transplanting a plant you have grown from seed you should do this once they have at least two sets of true leaves and are large enough to handle easily. This should be done after the chance of frost has passed and when night time lows are no less than 15°C (5°F). Using a trowel, dig holes around 10 inches (25 cm) apart and deep enough that your plant will be at the same level as it was in the seed tray or pot. Backfill and firm in the soil before watering well. If your verbena has self-seeded you can remove the seedlings and move them to a different position so that they don’t become overcrowded. Water your plant regularly until it is well established. After this, plants require little maintenance. An annual application of well-rotted manure or soil improver and a weekly water should suffice. Though these plants are tall, they are sturdier than they look and do not require staking. If you regularly pick the flowers for indoor displays you may find this causes the plant to grow less high and a little bushier which is not necessarily a bad thing as this plant does have a tendency towards straggly growth. The light airy structure of this verbena makes it perfect for herbaceous borders. It can be woven between other plants to good effect. This plant also looks good by itself planted in swathes creating a delightful purple mist. It also goes well with ornamental grasses and other prairie style plants such as Rudbeckia. Verbena Bonariensis also works well in a cottage style garden with other airy plants such as cosmos, larkspur or scabiosa. The lavender purple flowers contrast nicely with bright yellow flowers or foliage. Alternatively, try it against a backdrop of purple or red shrubs such as Smoke bush Cotinus coggyra ‘Royal Purple’ or Barberry Berberis thunbergii Atropurpureas. Verbena Bonariensis does not require much pruning. You may want to cut back stems with sharp scissors if they begin to get a bit leggy. Seed heads can be left on to add interest to the winter garden and to allow them to self-seed. In late winter or early spring, you may like to cut the plant back if it looks untidy and to prevent it becoming straggly. Cutting back at this time stimulates new growth from the base of the plant rather than the old stems, so it helps keep the plant neat and avoids having lots of old woody stems. Verbena Bonariensis is easily propagated by seed. The seeds may be planted directly into the ground in spring, usually around May. They are slow to germinate so watch out for them to make sure you don’t accidentally weed them out. Alternatively, you can start them off indoors or in the greenhouse or cold frame in late winter. To sow the seeds indoors, start 12-14 weeks before the last expected frost in your area. Sow in trays of seed compost and cover the seeds with compost to a depth of 4 times the size of the seed as they need darkness in order to germinate. They can be potted on or planted out once they have two sets of true leaves. You may also take cuttings of the plant in September. Cuttings must be taken from side shoots as the main stems of this plant are hollow. Choose a non-flowering shoot and snip off with clean, sharp scissors, cutting just below a leaf node. Remove the lower leaves and dip the base in rooting hormone powder. Insert into holes, prepared with a dibber or pencil, in 4-inch pots filled to an inch from the top in damp potting compost. Cover the pots with plastic bags to help retain moisture. The cuttings will need to be kept in a spot that is protected from frost, such as a cold frame, greenhouse or a very sheltered spot near the house. They can be kept indoors in a cool room if necessary. Remove the plastic bag once a week to give the cuttings an airing and to check for and remove any dead or dying matter. Water them well before replacing the bag. Once the plants are putting on new growth and roots they can be planted out in a suitable position in the garden. Verbena Bonariensis is usually pest resistant and disease free. Occasionally, however, it may fall foul of the following pests and diseases. Aphids, such as blackfly and greenfly, can become a problem. Usually, these can be removed with a strong jet of water or spraying with a soap solution. Encouraging beneficial insects such as ladybirds and lacewings can also help keep them under control. Plants that are suffering from scale insect infestation may show poor growth. They may also lose leaves. This can weaken the plant as it makes it difficult for it to photosynthesize. The mature female insects may be in evidence on the stems. They are coated with a waxy substance which can make them difficult to treat. The females lay eggs which then develop into crawlers. Because of this complex life cycle, pest treatments will need to be repeated at intervals, usually starting in May, to kill off the crawlers and eggs. Spider mites can be a problem as they eat the plant leaf cells by piercing them with their mouthparts. A female spider mite can lay a hundred eggs in their lifetime, which hatch out after just a few days, so these pests can soon get out of hand. 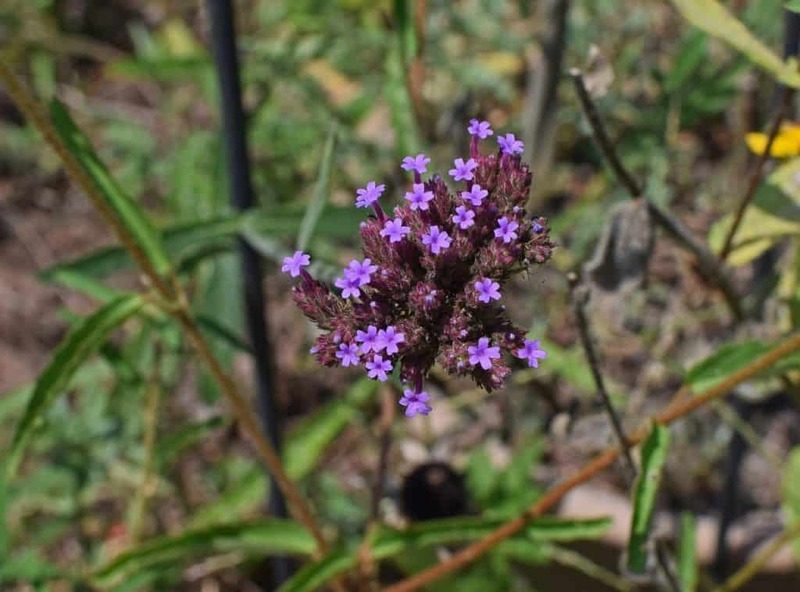 Though they are rarely a problem for verbena, it is worth keeping an eye out for them and removing any affected material at the first signs of trouble. If your plant is infested, try misting it with water as spider mites prefer a dry atmosphere. There are chemical controls you can use if these pests become a problem. Powdery mildew shows as white patches on the leaves. You should remove any affected parts of the plant and destroy them to prevent the fungus from spreading. As powdery mildew is a fungus it thrives on moist, humid conditions. This means that increasing air circulation and reducing moisture are key to getting this disease under control. Ensure that there is adequate air circulation around your plant, by cutting back other plants if necessary. Remove any weeds from the area around your plant, too. Watering your plant at the base rather than on the leaves is the best way to reduce powdery mildew. It is also important to water early in the day if possible, so that moisture has a chance to evaporate in the sun. Leaf spot causes the leave of your plant to become covered with small of brownish, reddish or black spots. These can spread into one another causing large blotches. This condition can make it hard for the plant to photosynthesize. If your plant is affected remove all infected material and dispose of it in the rubbish rather than composting it to prevent the infection spreading. Follow the advice on watering and air circulation in the above section to reduce humidity and make conditions hard for this fungus. Fungal sprays are available if the becomes severe. Rust gets its name from the reddish-orange spots it causes on the leaves of plants. However, rust can also be brown, black or white. If only a few leaves are affected, then these should be picked off but if most of the leaves are affected picking them off can do more harm than good. Often rust occurs quite late in the year and so rarely does much harm to the plant. However, a fungicide may be used if required. Q I planted lots of Verbena Bonariensis last year but none of them has come back. What happened to them? Verbena is not always reliably hardy. This means that they can be killed by very cold weather. In colder areas of the country, many people treat them like an annual and replant or sow them every year. It’s often a good idea to take some cuttings in September just in case your plants don’t make it through the winter. Luckily verbena Bonariensis is easy to grow from seed and often self-seed so getting more of these lovely plants is easy to do. Q My Verbena Bonariensis has wilted and many of the leaves have gone brown even though it is midsummer. What could be wrong? There are several reasons your plant may not be doing well. Usually, when plants suffer it is due to them being in the wrong conditions. Check that you plant is getting plenty of sunshine and is not sitting in boggy soil. Make sure you water it once a week in dry weather. If your plant is happy in its situation then the problem may be a disease. Diseases are often fungal in variety so improving air circulation around the plant may well help. Cut back anything that is encroaching on your verbena’s space and remove any weeds from around your plant. Remember to always water your plant at its base rather than on the leaves to help reduce the moist conditions that fungi love. Q Verbena Bonariensis is self-seeding everywhere in my garden. I love this plant, but I don’t want it all over my plot. How do I stop it spreading? Your verbena seems to really like conditions in your garden so is happily self-seeding in every nook and cranny it can find. To reduce the chances of this plant spreading to places you don’t want it you can remove the flower heads before they set seed.